Construction of this cigar is well above average, the dual bands blend well with the oily Cameroon wrapper. The wrapper itself is rolled on with no visible seams and you would pretty much have to call the wrapper vein free. Feeling down the body it was firmly packed full length and the foot had aromas of black pepper mixed with oak. Once the cap was clipped I found the same pepper and oak mix from the free cold draw. As this cigar took to the flame, the explosion hit; a flavor explosion that it. The first mouthful of smoke hit me will a full bodied blast of saddle leather, oak and some floral notes. What a surprise, I was expecting perhaps some mild bodied cream, toast or something along those lines. As the burn progressed there were other flavors of cinnamon, anise, brown sugar, mild black pepper and a hint of barnyard. 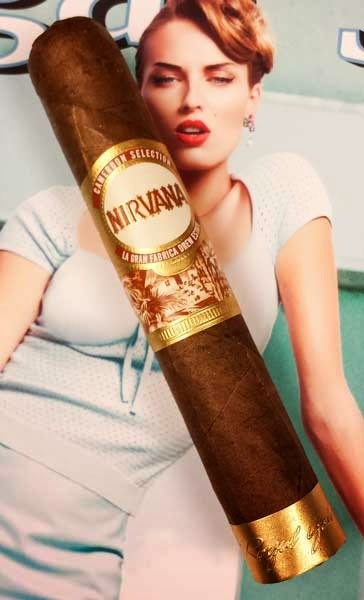 The Nirvana wasn't super complex but it was a great full bodied flavor mix. Burn wise this cigar again was near perfect with it's razor sharp burn, the oily wrapper and a light gray ash that held on until the mid point. A 30 minute smoking time was a bit short, but it was a pretty small cigar, I just wanted it to last longer. 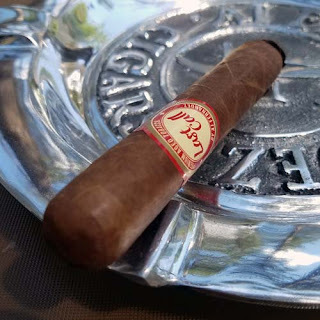 The boldness of the flavors and the strength of this cigar did surprise me, but it was a pleasant surprise! Drew Estate and Royal Gold cigars came up with a real winner here!